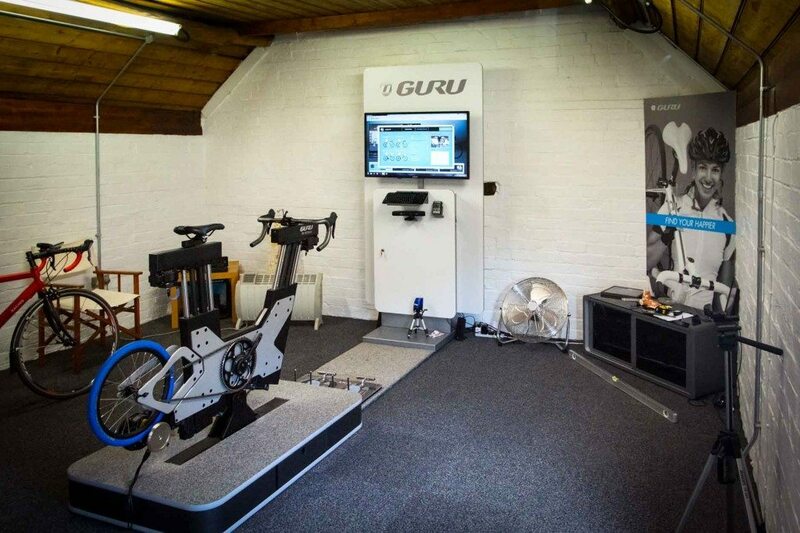 There are currently four locations in the country which have GURU bike fit machines. Luckily enough my local bike shop – Stratford Cycle Studio has one. Now before we get any further, let’s just address the fact this was at my local bike shop. This is NOT a sponsored review or anything of the like. I paid for and had my Guru bike fit at the Cycle Studio in July before my accident, and setting up TitaniumGeek. I was EXCEPTIONALLY impressed with the actual fit and the aftercare I received, going in for a second fit, to adjust a few niggles a month or so later. As such, that is why I have published this review. I have an unbiased experience of the product and feel that it is an appropriate review, from both health and fitness to have here on the site. All photography, and additionally background information was taken after my accident, in order to provide illustrations to the points I make. Guru Bike fit – Who? 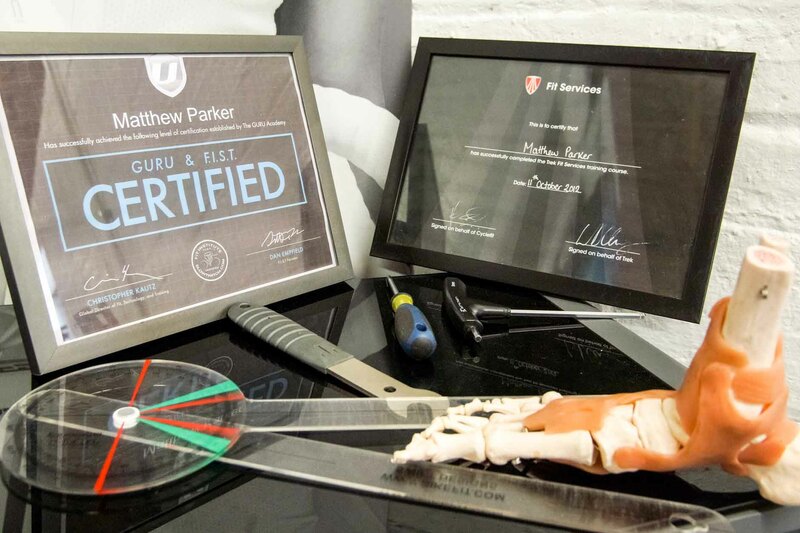 The Guru bike fit is performed by Matt who has considerable experience in performing bike fits, and has worked with the Guru bike fit system for two years now, after having been trained and certified by CycleFit London. A group you may have heard of for doing the bike fits for the Trek Factory team, and the BMC team. Matt describes this team in London as the best in the world – given that the guys who taught Mat all he knows just did the bike fit for Fabian Cancellara on his Trek Domane prior the winning the 2015 E3 Harelbeke race in Belgium, he’s probably right!! The hope is that they managed to teach him some of their magic too! The first thing when going into a bike fit, is to ask why? What are you looking for? Do you want greater speed, endurance, just a better…what’s the word – FIT! 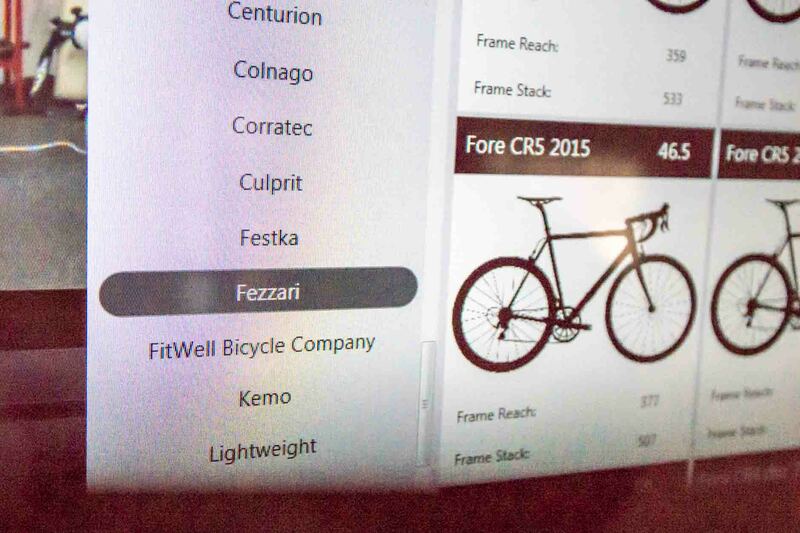 A good bike fit can help – apparently. I’ve got to admit, greater speed? Just from moving the stem a bit, I was entirely convinced, but then that wasn’t why I was attended. I’m a lanky chap, 186cm, 72kg, and with most of my height seeming in my chest, rather than my legs. As a result of this, I’ve been through several bikes, and they have all felt, not quite…right. I started off with my first road bike from a shop in Coventry. Now bear in mind, I knew NOTHING about bikes then, some might still say now, but then I didn’t really know the difference between a hybrid and a race bike. The chap who sold it to me, asked my height, measured my legs, pulled a bike off the rack and said give that a go. I pooled round a couple of streets, returned to the shop, he moved the seat, and the sale was made. A 56cm Scott Speedster 60 was mine. I subsequently moved to a Scott Addict r3 a few years after. 56cm please – and off I went. As I started to do triathlons and longer rides, I realised I always felt I wanted to lean further out on the bike, so-called a few guys in the area. It boiled down to guys with a tape measure, protractor and video camera, vs the Guru system, for very similar prices. As Matt will tell you, I’m a pain in the neck; I’m aware of minor differences in things. My optician also agrees, it took a consultant ophthalmologist 45minutes actually to identify a refractive error in my RIGHT eye. After three different people had been needed to look at my eyes. At the end of the consultation, error identified and corrected for, my sight was 8/6, so better than normal, but the consultant was very candid. There was a slight error in my vision, he did correct for it, but how I’d actually noticed it, he wasn’t sure!! The bike fit for me was the same, so seeing the Guru machine, with its minutiae of variations, I knew was going to be the best option for me. A bike fit tends to be sought to address or improve something. I wanted to improve my position on the bike, to feel less cramped, and if possible address a niggling pain, occurring after about 20mins cycling on the outside of my right knee. If you look closely on the old video capture, you can see the knee support, which I’ve thankfully stopped needing now! So first things first – we ditched the bike!?! Yes, a bike fit looks at the whole of you, seeing how flexible you are, what your stance is, that is why there is a myriad of saddles and handle bars on the wall. The Guru bike fit utilises the Fizik Spine Concept system. 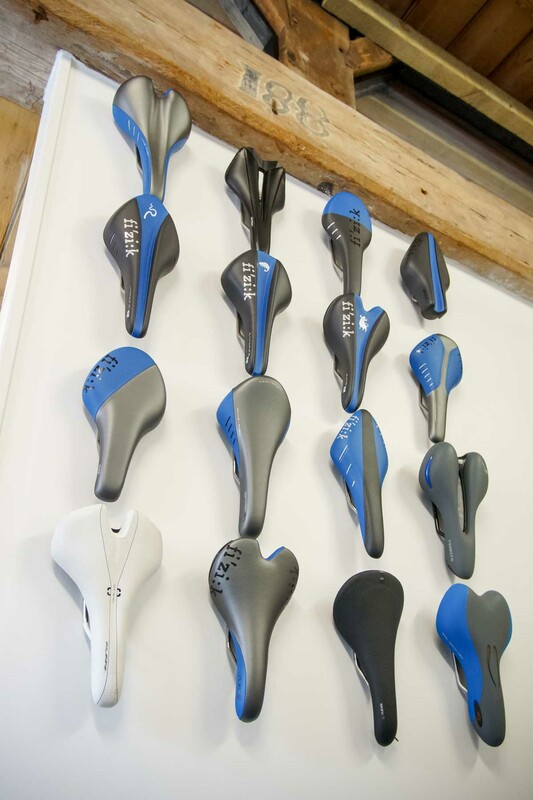 As such, there is a range of saddles on one wall, which when its been determined how flexible you are, the corresponding saddle is attached to the Guru bike fit frame. What animal are you? Fizik thinks I’m a Chameleon! Shockingly, I’d always thought of myself as rather flexible, as was expecting to be fitted to a “Snake” saddle, however, on the day I fell just between the two, and so a “Chameleon” was suggested instead. If you see in the above picture, on the second line of saddles from the top, you can see the “animal” branding on each saddle. I then had various measurements across the shoulders to ensure I was using the right size handlebars, although with the caveat that “right” size also depends on how aerodynamic you want to be. From looking at how flexible I wasn’t, off came the shoes to see whether I was “in line”. This apparently was going to be quite important, due to the comments of pain to my right knee. About the knee, I’d looked at the ideas of possibly iliotibial band dysfunction, a typical cycling complaint, resulting from over use, patella mal-tracking, and a possible weakening of my medial quadratus muscle, on the inside of my leg. During my rowing days (That makes me sound so old! ), my quads were, rather massive. But since getting off the rowing machine, neither running nor cycling put the same level of force through the inside of the leg, and so these have reduced a bit. The reason why I put all of these suggestions in, all of which are eminently sensible, and the pain did respond slightly to the corresponding treatments. You can only treat what you know. If you don’t know there is an alternative diagnosis, you don’t look for it or treat it. So with that, I stripped off my shoes, and stood on the plates of metal of the “A-Line Insole system”. “OK, so this is looking at where I place my feet, yadda, yadda, yadda. I run, my feet are fine.” I’ve never been a big believer in custom orthotics for running and hiking unless you’ve actually got defined problems like plantar fasciitis etc. 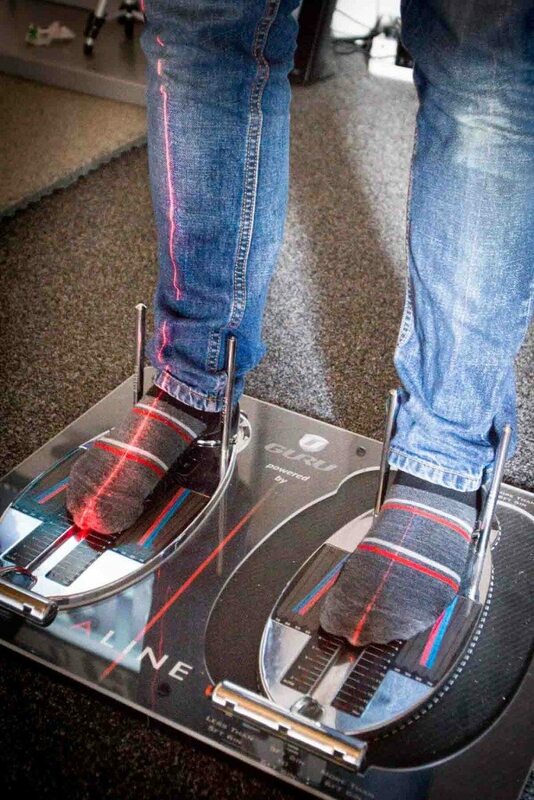 So I stand on the A-Line plates, and a laser is shone up the leg, from the bottom of my foot. My ankle is pointing quite far out from the line of my foot and leg. 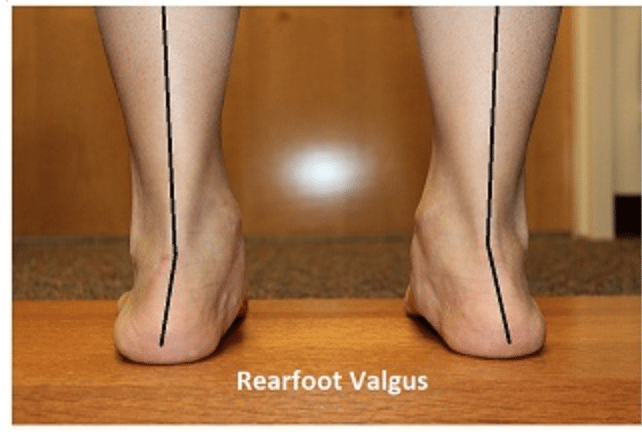 A valgus deformity. Now, this isn’t just some salesman’s trick. It’s a real deformity, I’d just never noticed before. Possibly because I can’t look at my feet from behind! So the answer here was to add a custom insole (Here we go) that was built up with little sections on the inside of my foot. However these are not like the soft insoles you’d get in Boots, but are rather hard plastic, as the intention is not that you walk on them, but cycle in them. So having the inflexible sole helps support the sole, in my case from rolling inwards, and allowing the minimal loss of power in flex, to drive better transfer of power from the foot, through the shoe and into the pedals. Giving a more supportive version of the carbon chassis of the cycling shoe. The reason for adjusting this is biomechanical and makes a lot of sense. If you want to push down with a lot of power, you want a nice straight line. If there is a bend in that line, as a joint as is shown above, the power moves from being central, through the limb, and you get extra pressure on one side or another of the joint. At medical school we are always taught, if a joint has a problem, check out the joints above and below it, as the problem might actually be there. In my case, the pain in my knee was partially due to the alignment of my ankle on the RIGHT. With the ankle left au naturel there are increased forces going through the outside part of my knee, hence the pain. However, with the insole, adjusted, the forces pass through the centre of my knee, improving things significantly – although it must be said, not entirely. Never the less, I purchased a pair of the insole, and I honestly kid you not, the return ride home was considerably easier on the right knee that it had been for a long time! Then we finally got on the Guru Bike. 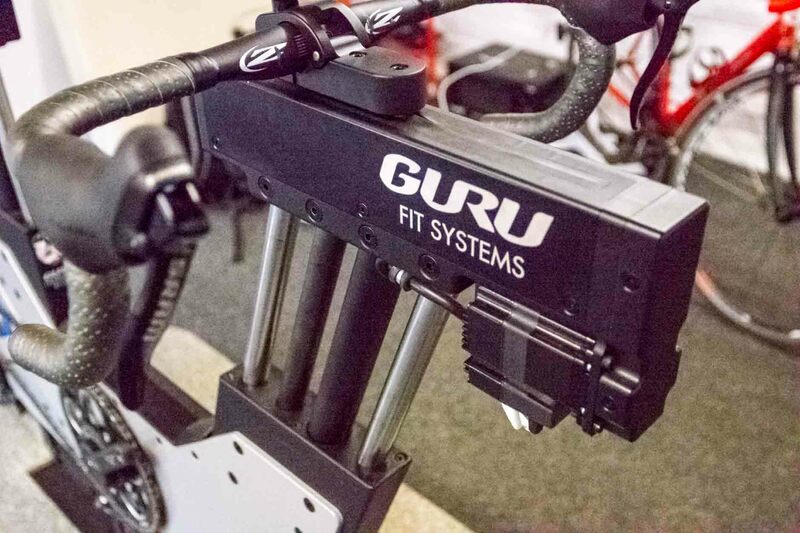 The Guru bike fit system holds hundreds, probably thousands of different types of bikes, road, hybrid, mountain, tri, cyclocross. Heck even in the road bike section there were manufacturers even the guys in the shop never heard of! Who are they – Fezzari? So sit on the bike, and you own bike is located on the system, and the guru adjusts itself to your own bikes size and geometry. It is an utterly alien feeling as the seat position, handlebar stem, top tube, reach, stem angle, frame stack – EVERYTHING adjusts so that you are sitting, size and geometrically, on your own bike. Choose a bike, any bike – go on. No prices listed! 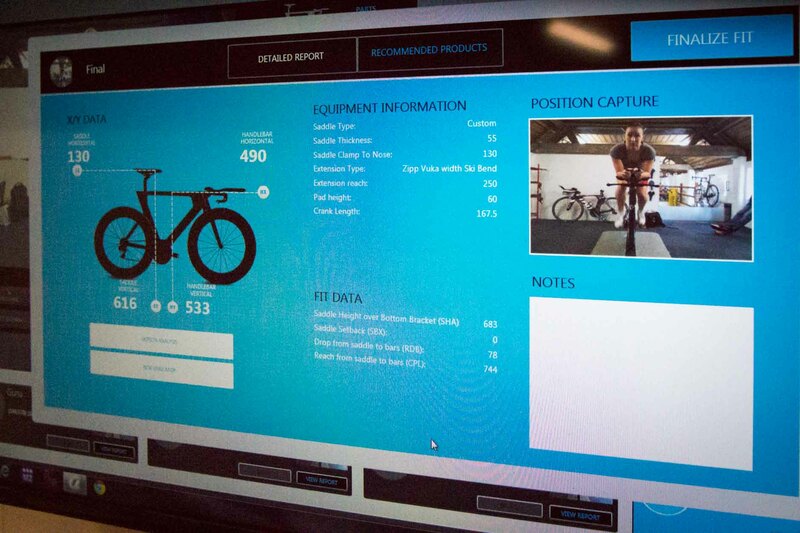 In front of the Guru, the bike sits the flat screen TV holding all of your details and current bike fits. Underneath the TV, however, is a very interesting gizmo. 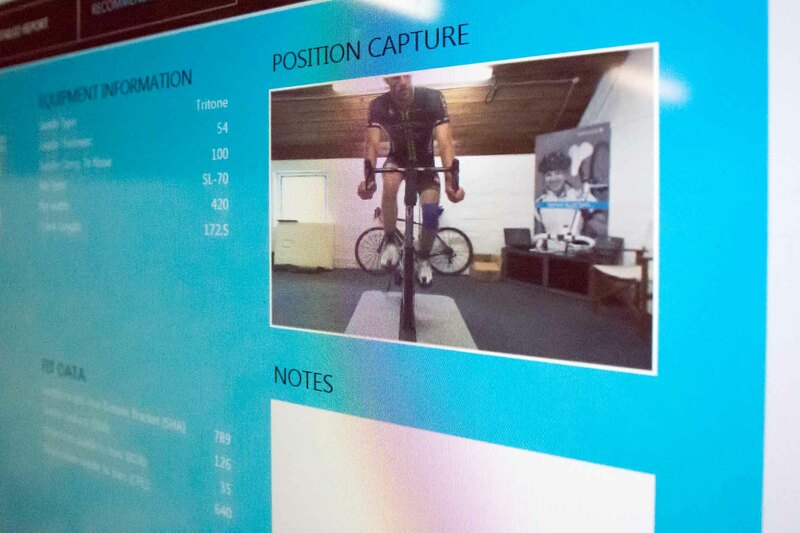 A Microsoft Kinect 360 is used by the Guru system to perform a Rider Scan, to actually look at how you are riding, and the position of your legs and arms as you do so. This is a fundamental part of the-the Guru fit. 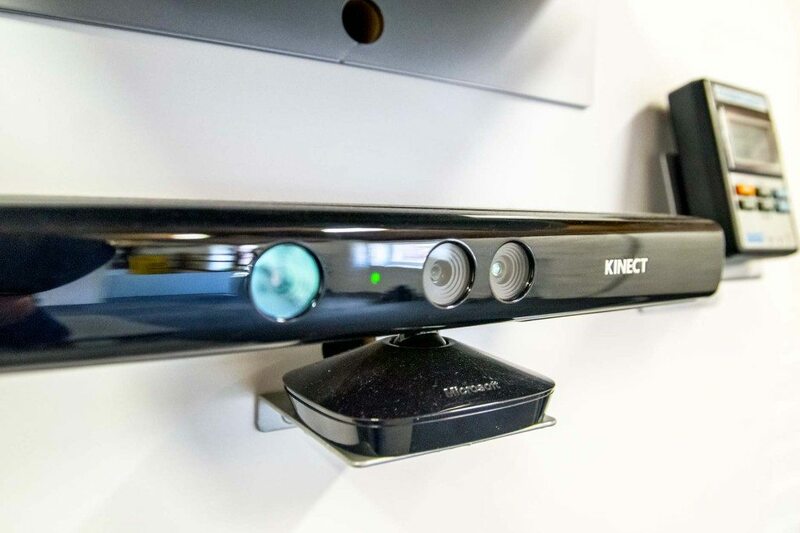 Guru Kinect 360 – I’m watching you! Having you sitting pedalling away on “your own” bike, to get you relaxed, and to adopt the positions you normally hold when on the bike – this allows for very accurate anatomical measurements to be made whilst in motion (without the need for Lord of the Rings style motion capture sticky dots) as opposed to the old method of “STOP PEDALLING!! Hold position, now where is my angle kit???”. From then the adjustments get made, a few degrees here, a change in angle there, a completely different bike from, a few more changes to find a bike frame and geometry that seems to fit. That is the interesting part, seems to fit. I came in convinced I need a 56cm frame. That was my size, always had been, what I needed was a long stem, perhaps different handle bars. It turns out I was on the wrong sized frame from Scott, but the wrong geometry and frame size in Trek. I need a 58cm top tube in my Scott, to overcome that “squeezed” sensation I’d feel, that I could stretch out enough. So I say, oh well, I need a 58cm then, I was thinking of getting a Trek anyway. Hold on there. The Guru is reprogrammed to a 58cm Madone. It’s too small! On a Trek geometry, I need a whopping 60cm frame!! At this point, the real power of the Guru bike fit begins to become clear. Not so much for tuning your bike. Realistically there is only so much you can do if your bike is the wrong size – we compensated with an elongated stem as far as possible, but any longer than 140mm and you are going to start having effects on the steering response etc. 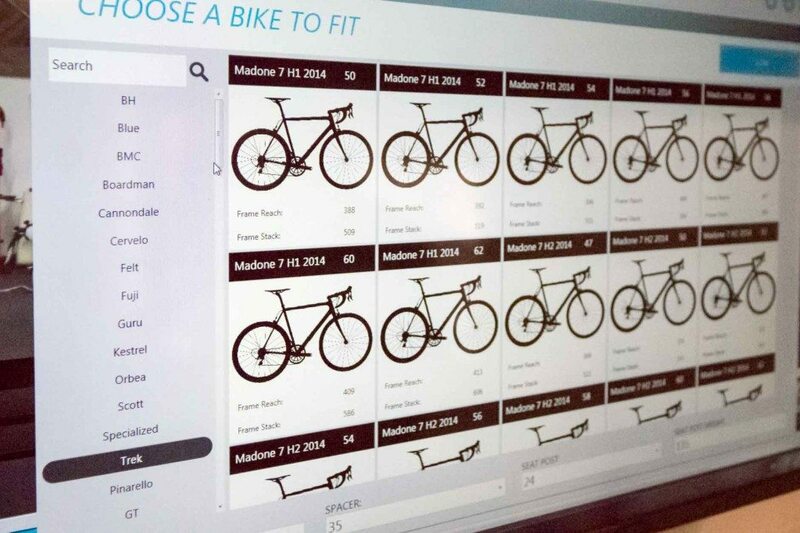 The Guru contains a section of the software called Bike Discovery, allowing you to quickly swap between different bikes, different stems, different sizes within the same and different company when you are at the stage of buying a new bike/Frame. Matt recounted a story of a chap you had come in for a bike fit. The chap was set on a Trek Domane. He knew exactly what he wanted, but wasn’t entirely sure of the size. Mat check all the guy’s measurements, flexibility etc and thought that the Domane was going to be far too aggressive for this particular clients frame. So the Guru was set up, an appropriate size found, and the chap was happy. It was then explained the “bike” he was sitting on wasn’t a Domane, but a Cannonade Synapse. 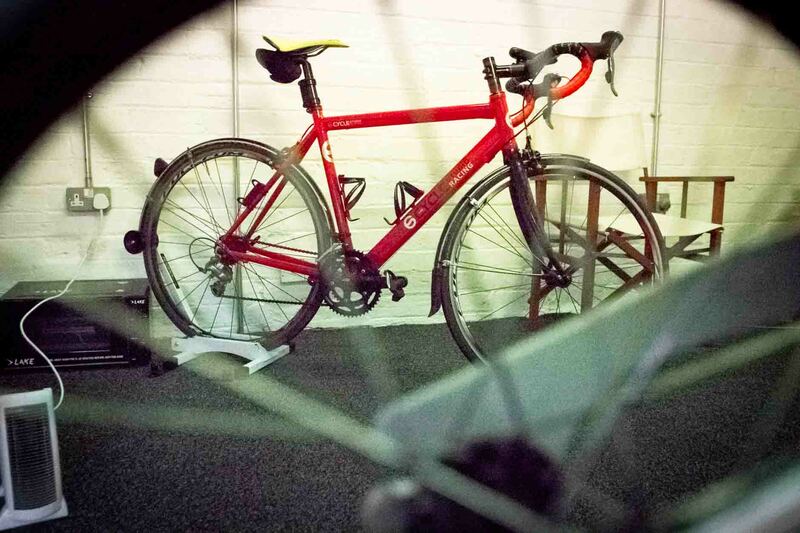 When the Domane frame was put onto the Guru, the man found exactly as Mat has expected, that not only did he feel very vulnerable with the longer, more aggressive stance, the Domane wasn’t comfortable for that particular customer. Yes, it would have been very easy to sell the customer a £1700 bike he wanted. But by selling a £999 bike, the customer got what he needed, what was best for his body type, and the realisation that the customer was put before making a sale. Back to me. There was little I could do on my bike, other than the stem adjustment, particularly because apart from the top tube, I’d by more luck that skill managed to get everything to the best fit I alright could. However, that didn’t mean it was the end of the story. We spent at least another 30mins playing around with small adjustments to the cleat of my RIGHT foot and its pedal. Trying to get my foot in the best position to reduce the RIGHT knee pain. One of the biggest changes to both of my cleats was that Matt shifted them as far back as they could go. Previously people had tried to get their cleats under the ball of the foot, but the studies trickling out of the Tour and other professional races, had found no loss of power transfer moving the cleat backwards, but a distinct benefit to joint problems in the leg, possible as the foot wasn’t being asked to pull on the leg as much in this position. This information highlights a lot about the bike fit. Bikes have only been around for 150years. As human beings, we are completely maladapted to sitting on a bike for a long period. Thus the science of the bike world, including geometries is moving at a rapid rate. A bike fit, can help you get the most out of your bike, and help prevent injuries associated with poor posture related to seat height, crank length, and a myriad of other variables, which will have specific impacts on your body, which will likely be completely different from anyone else’s. 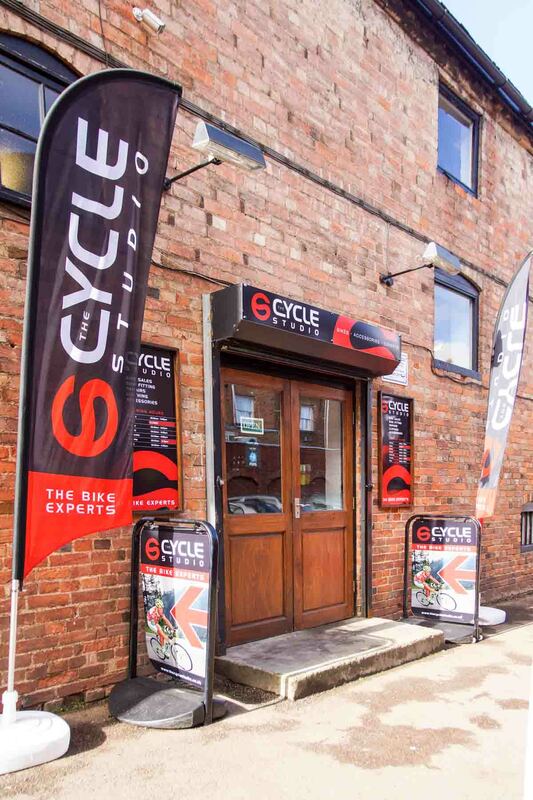 To date, The Cycle Studio, via the GURU bike fit system, has helped hundreds of people in purchasing a bike that is the best fit for them. Over the last two years, they have done a total of 44 complete bike fitting, each taking approximately 90mins, from chaps like me trying to sort a specific bike problem to Triathlon World Champion Jodie Stimpson who had her Tri bike fitted and fettled to get the maximum performance possible at the Cycle Studio. After my bike fit, although there was a significant improvement in my right knee pain, it was still there on longer rides. After changing my bike, to a longer top tube Scott Foil. I copied over the dimensions as recorded from the Guru bike fit, and still found an issue. On return to The Cycle Studio, even with the new bike frame, the geometry and setup I had on the bike were confirmed to be correct for me. However, more attention was paid to the RIGHT cleat again. 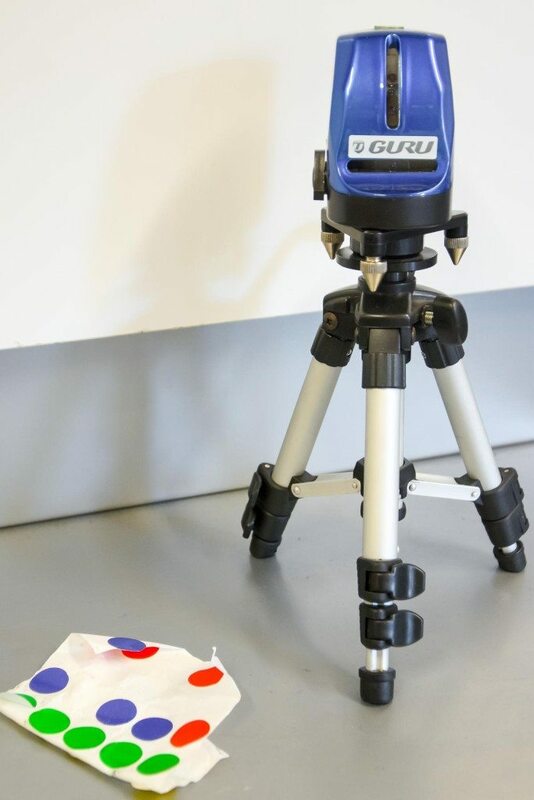 Now earlier I mentioned no need for sticky dots using the Kinetic 360 camera for the biometric measurements, the Guru bike fit is good, but sometimes the human eye is better. Out came the sticky dots. One on each shoe toe and one on the knee. From there Matt was able to determine my RIGHT knee deviated outwards slightly during the pedal stroke. A thin washer applied to the inside of the RIGHT pedal arm, slightly moving the pedal out, while adjusting the cleat in completely sorted things. On 10km ride back from the shop was the first time I’d not had any odd feelings in the knee at all – so I call that a win! Hopefully, as I’ve demonstrated, the bike fit is an important part of getting the most out of your bike. 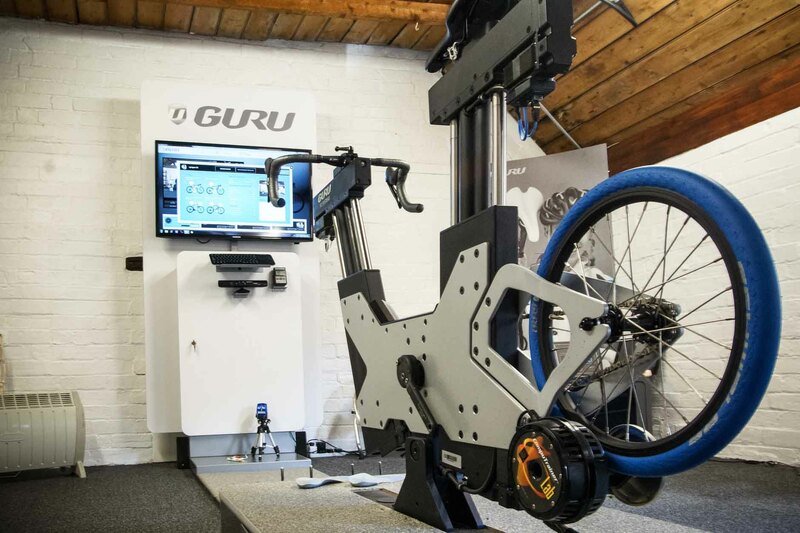 Many parts of a bike fit you might be able to approach at home but to truly get the best bike fit you can, you really need to have another pair of eyes, someone who knows what they are doing, plus a Guru bike fit machine can be quite helpful too!